New York — As part of its TT Gives Back initiative, a team of 10 Thornton Tomasetti engineers from six offices recently traveled to Boca de Lura in Panama’s Coclé Province for an international service mission, partnering with Bridges to Prosperity to help provide a crucial passage over the Lura River for area residents. Since 2001, Bridges to Prosperity has built nearly 300 suspended pedestrian bridges in isolated communities across 22 countries. 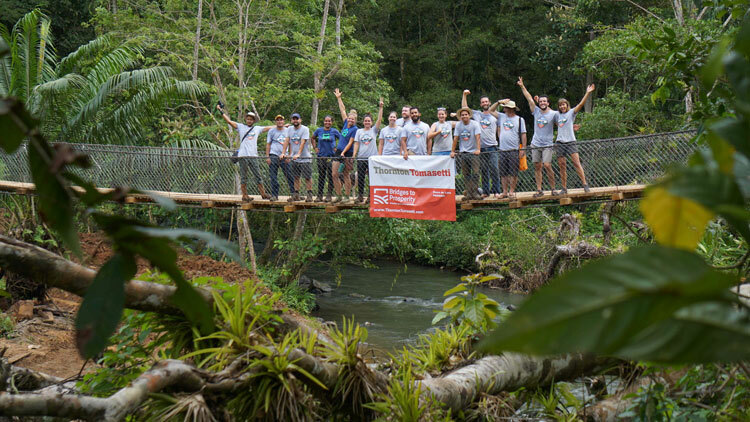 The trip to Panama is the first Bridges to Prosperity project completed as part of Thornton Tomasetti’s recently established TT Gives Back program, designed to encourage, improve and increase volunteerism opportunities for employees, build leadership skills and increase Thornton Tomasetti’s social impact. The program supports at least one service project per year in collaboration with an international community service organization. The pedestrian bridge in Boca de Lura will directly benefit a community of more than 1,170 women, children and subsistence farmers who raise cattle and grow rice, corn, plantain and yucca, and depend on crossing the Lura River to access the local hospital and health center, schools and the local market. The river floods over for about half the year, making it dangerous to cross. Thornton Tomasetti’s engineers worked side-by-side with the community’s residents to arrange the cable placement, decking and approach ramp to the new crossing.